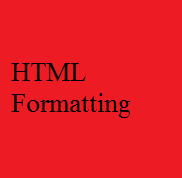 If you use a word processor, you must be familiar with the ability to make text bold, italicized, or underlined; these are just three of the ten options available to indicate how text can appear in HTML and XHTML. The content of a <tt>...</tt> element is written in monospaced font. Most of the fonts are known as variable-width fonts because different letters are of different widths (for example, the letter 'm' is wider than the letter 'i'). In a monospaced font, however, each letter has the same width. The content of a <sup>...</sup> element is written in superscript; the font size used is the same size as the characters surrounding it but is displayed half a character's height above the other characters. The content of a <sub>...</sub> element is written in subscript; the font size used is the same as the characters surrounding it, but is displayed half a character's height beneath the other characters. Anything that appears within <ins>...</ins> element is displayed as inserted text. Anything that appears within <del>...</del> element, is displayed as deleted text. The <span> element, on the other hand, can be used to group inline elements only. So, if you have a part of a sentence or paragraph which you want to group together, you could use the <span> element as follows.